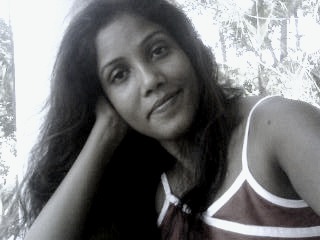 Stella's Musings: Maoists 'pro-tribal' Bandh? Well, I call it a farce! One of the many chronic illnesses that Indian politicians suffer from is the tendency to call a Bandh (shutdown) at the drop of a hat. And this is an illness prevalent among politicians cutting across the lines of ideology, color and regions. Besides causing huge economic losses (sometimes in billions of rupees) and utter inconvenience to common people, most of these Bandhs are also ill-conceived and don't seek a true solution to the problem. And yet another example of that is the Bandh called tomorrow (Saturday, 14th April), by the Maoist rebels in eastern India to seek higher prices for Kendu Leaves. 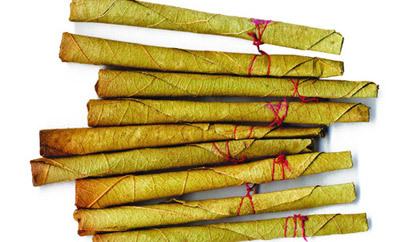 The flat, oval shaped leaves of Kendu trees (in picture) are used to roll Bidi (also known as Beedi)- an unfiltered, coarse cigarette indigenous to India. Kendu leaves are found in abundance in several states of east and central India such as Odisha, Jharkhand, West Bengal and Chhattisgarh. 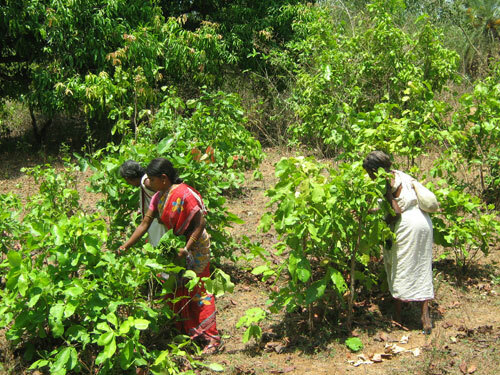 Hundreds of tribal families living in forest areas regularly collect and selling them to Bidi manufacturers who pay them INR 60 - 120 for 2000 leaves. The Maoists are now demanding - and the bandh is in support of that demand - that the buyers hike the price by 20% because the current rate isn't sufficient for the tribals to sustain themselves. The Bidis (which the Kendu leaves are made of) have higher concentration of nicotine and are more dangerous (cause cancer and tuberculosis) to health than cigarettes. Also, Bidis are far more cheaper than cigarettes which is why the bidi smokers are usually people with low income: daily wagers, construction workers, rickshaw pullers and more alarmingly, street children etc. Once sick and stricken with lung or oral cancer, most of these people die without treatment simply because they can't afford the treatment. And alternatives sure are available, provided of course that one really cares to think and initiate. For example, there are options like chicken rearing, pig farming, bee-keeping, silkworm rearing or/and weaving. Currently, the government of India is currently implementing Integrated Action Plan (IAP)- a special program that aims to develop 78 districts across central and east India which are also known as 'Maoist-controlled' areas. As it happens, these districts are also the areas where maximum Kendu leaf collectors live. Now, why not demand that the program IAP include providing alternative livelihood to tribal Kendu leaf collectors/bidi rollers? If that is done, it could be a new beginning for the tribal people - one that doesn't have to include rolling of a deadly virus by one poor family in a green leaf for another.